Put like in Facebook and get Company of Heroes 2 beta key! It’s not the first time when the developers from different companies is distributing game’s licenses or keys to the closed test using social networks. It seems that Sega company earned enough on Company of Heroes 2 pre-orders and they decided to invite new user to the test servers if they help to promote the project. - enter the activation key in the field. It’s strange why such a large publisher opened free access to the product, which is already being successfully marketing and selling? There was a good reason ... The very name of Company of Heroes 2 Beta Stress test speaks for itself. For those who do not know, "Stress-testing" - is the product testing under the critical conditions or loads that can detect unstable and problem areas. Apparently after a poor SimCity start from EA a lot of publishing and developers’ companies have had a serious thought about constantly growing problem of not enough high-end servers and bad web channels, which spoils the gameplay of most of the new projects. Also we would like to recall that in the beta-version will allow to play on 6 maps, where you can try your hand at the battle with the AI ​​or other players in the combats 1x1, 2x2 and 4x4. In addition, you will be able to reach the 40th level in your commander abilities. You can read more details about the game in our article by following the link. 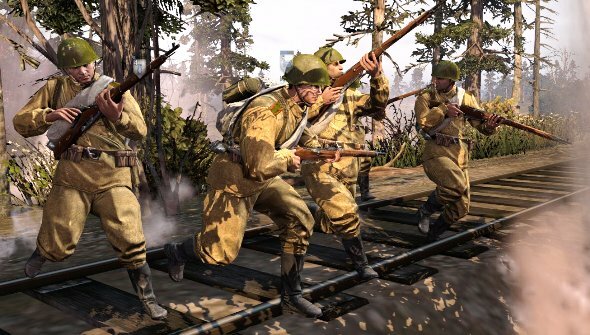 Final Company of Heroes 2 gameplay you will be able to see in June 25 this year.